From 16th to 24th August 2008 new talents - the junge biennale köln presents upcoming artists of the areas of media, art, film, music and design in the frame of the unique architectural ensemble of the Rheinauhafen in Cologne. Due to its academies of outstanding reputation in germany and abroad, Cologne has become a stronghold of artistic and creative education. new talents sets an example, presenting for the first time a selection of graduates of the following academies. A total of more than 50 graduates of the last four years have been selected. In this frame the Biennale is an example for the upcoming trend towards a crossover of the different areas, where clear classifications disappear. The graduates selected often completed a second interdisciplinary degree. 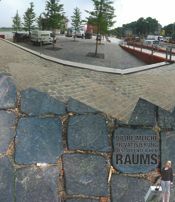 The recently reconstructed Rheinauhafen provides a unique platform for the project, hosted by the FUHRWERKSWAAGE Kunstraum e.V. and the Media Kultur Köln GmbH. With an appealing mixture of architecture protected as historic monuments and new urban highlights, the Rheinauhafen has become a centre for the creative economy in Cologne. With its unprecedented exhibition concept new talents 2008 represents a prelude to the inauguration of the Rheinauhafen, corresponding to the innovative character of the area. Along the boulevard, the passages and interiors, the area allows the visitor to discover new possibilities of artistic presentation and communication. Multifaceted accompanying events such as stage programmes, long film nights, live performances as well as symposia and technical discussions invite to a collective exchange.